It's smaller than any other planet - even smaller than the Earth's moon. It's dense and rocky, like the terrestrial planets (Mercury, Venus, Earth and Mars). However, its nearest neighbors are the gaseous Jovian planets (Jupiter, Saturn, Uranus and Neptune). 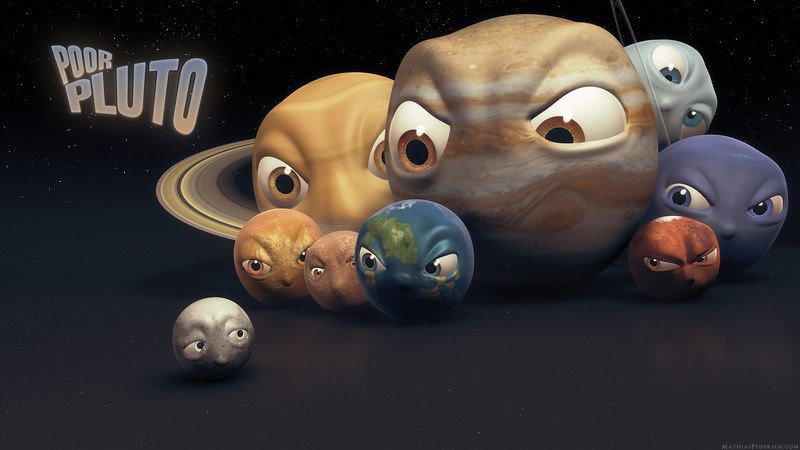 For this reason, many scientists believe that Pluto originated elsewhere in space and got caught in the Sun's gravity. Some astronomers once theorized that Pluto used to be one of Neptune's moons. Pluto's orbit is erratic. The planets in our solar system all orbit the Sun in a relatively flat plane. Pluto, however, orbits the sun at a 17-degree angle to this plane. In addition, its orbit is exceptionally elliptical and crosses Neptune's orbit. One of its moons, Charon, is about half Pluto's size. Some astronomers have recommended that the two objects be treated as a binary system rather than a planet and satellite. These facts have contributed to the long-running debate over whether to consider Pluto a planet. On August 24, 2006, the International Astronomical Union (IAU), an organization of professional astronomers, passed two resolutions that collectively revoked Pluto's planetary status. The first of these resolutions is Resolution 5A, which defines the word "planet." Although many people take the definition of "planet" for granted, the field of astronomy had never clearly defined what is and is not a planet. A planet is a celestial body that (a) is in orbit around the Sun, (b) has sufficient mass for its self-gravity to overcome rigid body forces so that it assumes a hydro-static equilibrium (nearly round) shape, and (c) has cleared the neighborhood around its orbit. Pluto is relatively round and orbits the Sun, but it does not meet the criteria because its orbit crosses Neptune's orbit. Critics of the resolution argue that other planets in the solar system, including the Earth, have not cleared the neighborhood around their orbits. The Earth, for example, regularly encounters asteroids in and near its orbit. A celestial body that (a) is in orbit around the Sun, (b) has sufficient mass for its self-gravity to overcome rigid body forces so that it assumes a hydro-static equilibrium (nearly round) shape, (c) has not cleared the neighborhood around its orbit, and (d) is not a satellite. Small solar-system bodies are objects that orbit the Sun but are neither planets nor dwarf planets. Another resolution, Resolution 6A, also specifically addresses Pluto, naming it as a dwarf planet. Not all astronomers support Resolutions 5A and 6A. Critics have pointed out that using the term "dwarf planet" to describe objects that are by definition not planets is confusing and even misleading. Some astronomers have also questioned the resolutions' validity, since relatively few professional astronomers had the ability or opportunity to vote.